Since Alice is in her Nemo phase, I asked the cake to be Nemo themed. Imagine my surprise and delight when Tavo delivered the cake for Alice's birthday. 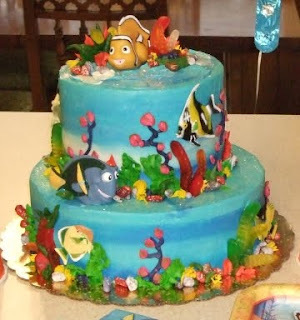 It was fantastic and more than I ever dreamed..I was thinking it would be nemo shaped, but this was fabulous! And it tasted delicious. We had cheese, fruit and chips for the kids to eat while they played outside. Her sandbox was a hit and they all played side by side in the sandbox for a while. They also took turns swinging on Alice's new playscape. We brought the cake out and Alice just about freaked! She grabbed Dori off the cake first, and we had to hold her back from sticking her hands all in the cake. We sang happy birthday and I cut the cake. The cake was so big, we only ate the first tier. Mom and Dad's co-workers got to enjoy the bottom layer the next week. Alice enjoyed eating the cake. She insisted on feeding herself at first, but later let us give her additional mouthfuls as she ran around and played. The playdate birthday was over, but Alice was full of cake, dirty beyond normal limits and happy. Aunt Pappa loves you too! You look like you had a great time and I'm sorry I couldn't be there.